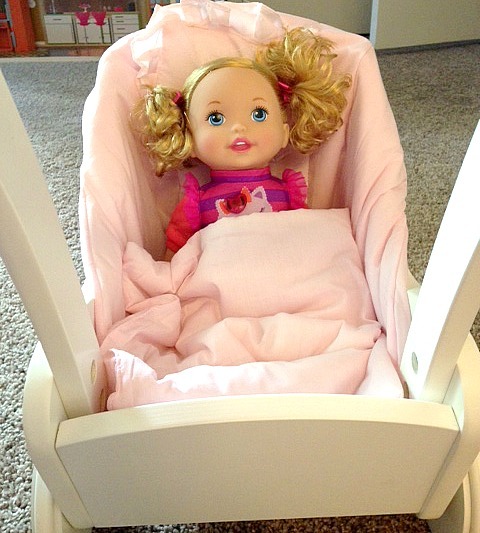 As some of you may know from a couple of my previous posts, my daughter loves her baby doll. She sleeps with it, feeds it, gives it loves, and pretty much acts like a little mommy to this doll. This is why I wanted to add some accessories to her doll collection to see if she would also love doing other “mommy” things. 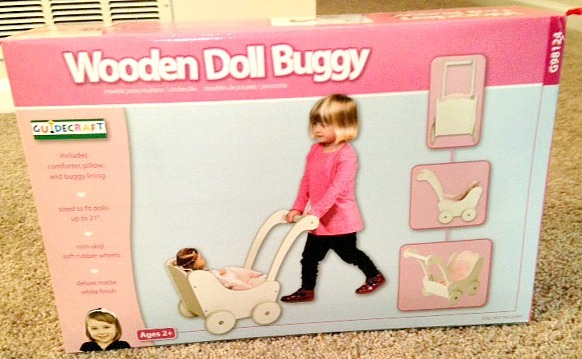 That is when I came across this adorable doll buggy from Guidecraft. 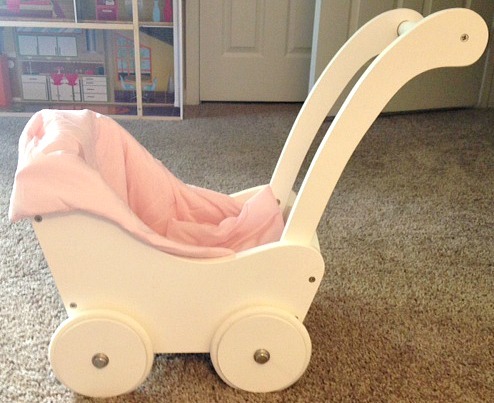 This doll buggy comes in three colors, white (this is the color I chose), natural and espresso and they come with three piece bedding which comes in pink. As soon as my daughter saw this box she started getting really excited saying over and over “wow” She couldn’t wait for me to get it out and put it together so she could start playing with her new toy. 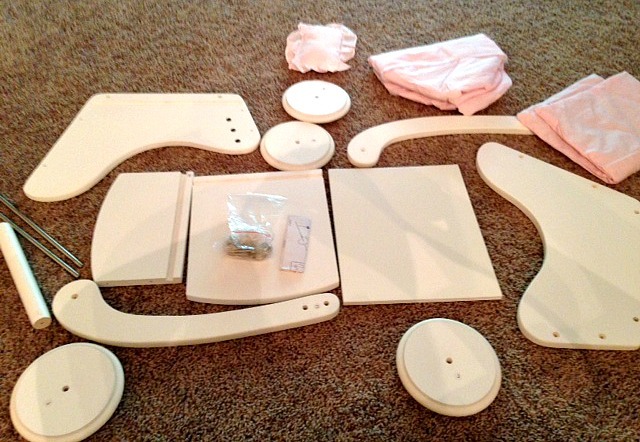 These are all the pieces that fit together to make the doll buggy. There aren’t that many so I thought it would take maybe at the most 45 minutes to put together. Most of the work is screwing screws to fit pieces together but of course there are holes already there to guide you. This turned out to be harder for me than I thought. I started putting it together an hour before I had to start making dinner and then when it was time for me to start making dinner I had only put the 5 pieces together to make the part of the buggy that the doll sits in and I had not completely gotten all of the screws in all the way. I think what happened was it was that is was hard to line up the next holes after putting in one so I accidentally put some of them in crooked. Eventually I did get it all together with a little help from my strong husband who was able to get the crooked screws in the rest of the way. 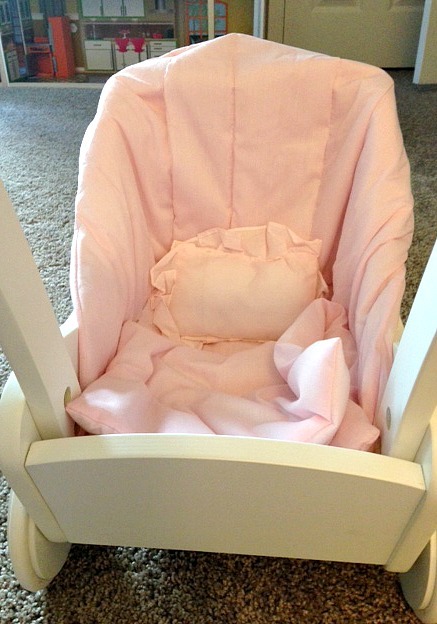 Above are pictures of how the doll buggy turned out. One of the good features about this product is that there are two heights that the handles can be put at. We put the handles at the highest height because our daughter has been sprouting up like a weed these past few months and decided we probably don’t want to have to adjust the height in a few weeks. Another great feature is the rubber tires so that if you have wood floors it shouldn’t scratch them up while you child pushes it around the house. The doll Savannah loves turned out to be a little too small for the doll buggy so it’s a good thing we got this bigger doll! She fits perfectly as would any American girl doll or doll close to that size. My daughter still of course loves to push her favorite baby doll around in it and has started to put one small stuffed animal in it with the baby, I guess to keep the baby company. She is becoming such the little mommy! Of course she had to get into it herself because as much as she thinks she is so big she also wants to be little. It is probably not recommended that your child sit in the buggy but who can say no to that face? Also look at that crazy hair! It’s getting too long for the top of the head pony tail which is about all I can do so my next project is going to be to learn new ways to do her hair! 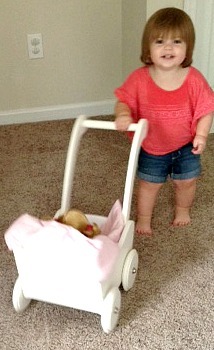 There’s my sweet little girl loving her new toy and loving being a big girl who pretends to be a mom! 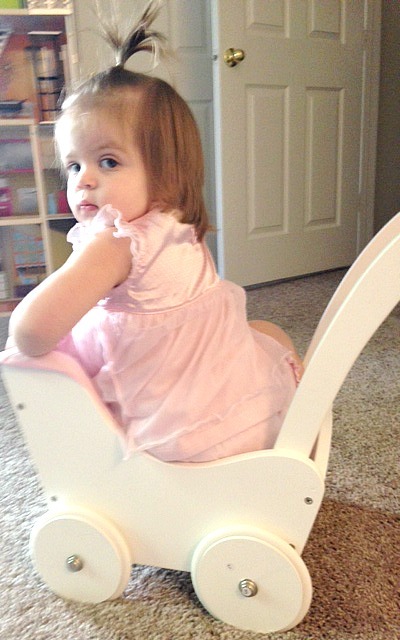 Even more hope that she will be a great big sister this December! I wish my little girl liked baby dolls. I have bought her tons of different kinds and accessories and she never seems to care. Its the same way she is with her new sister too lol. This is WAY cool! I wish I had one of these when I was a kid! I especially like that you can put it together as a family!